Jelurida today unleashed the potential for external enterprise systems to efficiently integrate with the blockchain using a streamlined smart contract life cycle management framework. 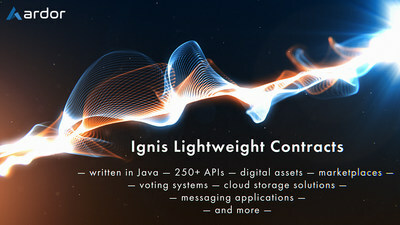 Ignis Lightweight Contracts on the Ardor platform are coded in Java, the most widely used enterprise software language on the planet. These revolutionary smart contracts utilize an elegant two-step deployment process - minimizing the data stored directly in smart contracts, while ensuring maximal data security. Ignis Lightweight Contracts process input data from a trigger transaction and the result is recorded on the blockchain as an output transaction. This intuitive design means for the first time ever, simply deploying a new version of the code and updating future trigger transactions is enough to upgrade a smart contract. It is also easier than ever to develop oracles that interface between external data sources and the Ardor blockchain since Ignis Lightweight Contracts automate specific processes without storing state information, like token balances, internally. Well-received lightweight contract templates and decentralized applications (dApps) have the potential to be sold or distributed open source through the existing Ignis marketplace. Fair play in contracts is ensured by a security framework that makes it easy to deploy verification and approval nodes to replicate contract calculations and outputs of the executing account. Additionally, Jelurida's innovative "hashed secret" solution ensures funds are never permanently locked in an Ignis Lightweight Contract when a contract fails to trigger. The combination of these solutions provides an unprecedented level of confidence in financial and data security when using the Ardor platform's public distributed ledger. Jelurida further expanded the Ardor platform's real world functionality with the activation of Asset Properties and the Max Property Group (MPG) child chain. Ignis has offered the ability to tokenize assets since its inception. Now, Asset Properties make it easier than ever to manage full supply chains on the blockchain by linking asset relationships and asset states. New guidance demonstrates three simple steps for tokenizing an agricultural supply chain. The Max Property Group (MPG) child chain represents the Ardor platform's most distinct real world use case since the launch of Ardorgate's AEUR euro-pegged token. Users that complete the necessary KYC/AML account verification processes with Max Property Group will be some of the first individuals ever to have access to on-chain real estate and investments.